BERWICK’s Therese Howell knows the heartache of watching a child struggle to use mainstream playgrounds. Her nine-year-old son Jack was born without a left hand, making traditional climbing gyms and monkey bars a challenge. 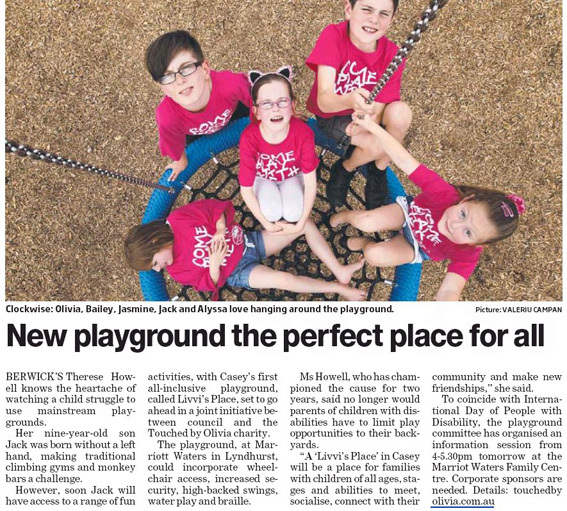 However, soon Jack will have access to a range of fun activities, with Casey’s first all-inclusive playground, called Livvi’s Place, set to go ahead in a joint initiative between council and the Touched by Olivia charity. The playground, at Mariott Waters in Lyndhurst, could incorporate wheelchair access, increased security, high-backed swings, water play and braille. Ms Howell, who has championed the cause for two years, said no longer would parents of children with disabilities have to limit play opportunities to their backyards. “A ‘Livvi’s Place’ in Casey will be a place for families with children of all ages, stages and abilities to meet, socialise, connect with their community and make new friendships,” she said.